It’s written by Frank Sinatra, in the September of 1990, to George Michael, following an interview Michael did with the LA Times’ Calendar Magazine. Talking on “the tragedy of fame”, Michael declared that he would shun the limelight before and during the upcoming release of his album ‘Listen Without Prejudice Vol. 1’ – meaning there’d be very few interviews, absolutely no promo videos and no tour. 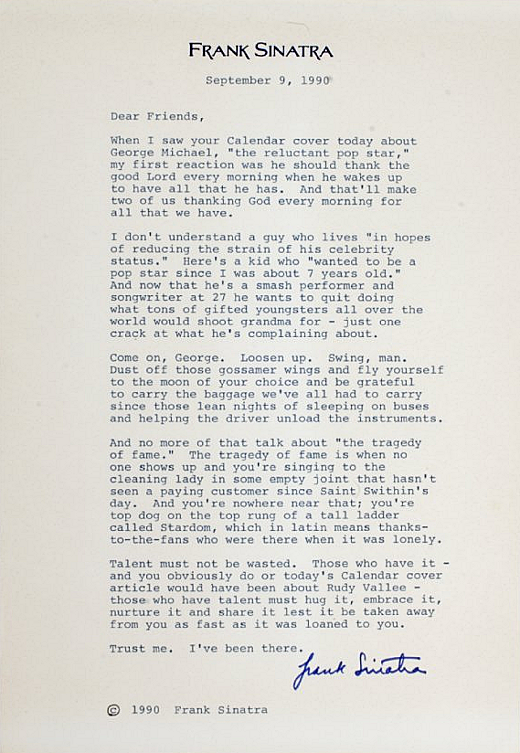 The week following Michael’s interview, Sinatra’s letter was published in Calendar Magazine. Talent must not be wasted … those who have talent must hug it, embrace it, nurture it and share it lest it be taken away from you as fast as it was loaned to you. But really the whole darn thing. Every word of it. There’s so many truths in it. So many absolute gems. 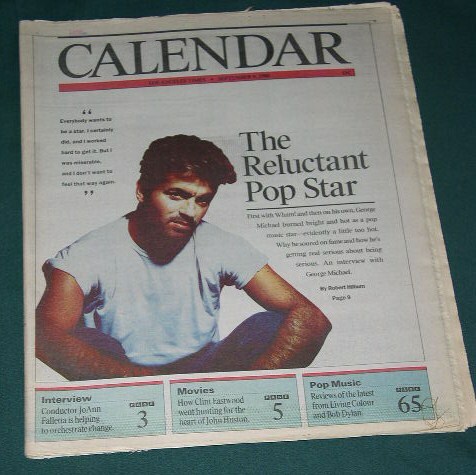 I’ve read it over and over and, to me, it’s not just a polite dust up of George Michael’s attitude. It’s a kick in the face to those coasting along. Those being ungracious. Those who aren’t hungry anymore. Take life a little less seriously. Be grateful for where you are. And what you have. You are stuck in a whirlwind of lament. But you have nothing to really complain about. See where the ride takes you. I believe two of the most important things in life are being yourself, wholly and fully, and being honest, with yourself, and everyone else. Over the past couple of days, I’ve grappled with the idea of ‘right’ and ‘wrong’ – doing the ‘right’ thing as opposed to what’s right for me. I’ve grappled with being the ‘bigger’ person, as opposed to being the best version of myself. I made a promise to myself a few weeks ago. And then the other night I drifted from it, just a little bit. And when, the next morning, I realised I’d drifted, I felt sick. To my core. So I swiftly went about fixing things. For me. Which was not particularly easy. But it was necessary. So necessary. Because if you’re not who you say you are, then you’re no one. If you’re not the person you promise you will be when the time comes to be it, then you won’t ever be anything. People spend half their lives ranting in their heads about all the things they’ll do and the words they’ll say, and then they stumble and quaver and choose the easy way out, the one that involves making no choices or avoiding the truth or shying away from the conflict or maybe all of those things combined. And they mask it all with phrases of ‘being the better person’ and ‘doing the right thing’ and ‘keeping the peace’ whilst the truth almost chokes them. Here’s a few truths; if you sit on the fence, you’ll live your whole life with splinters up your arse. 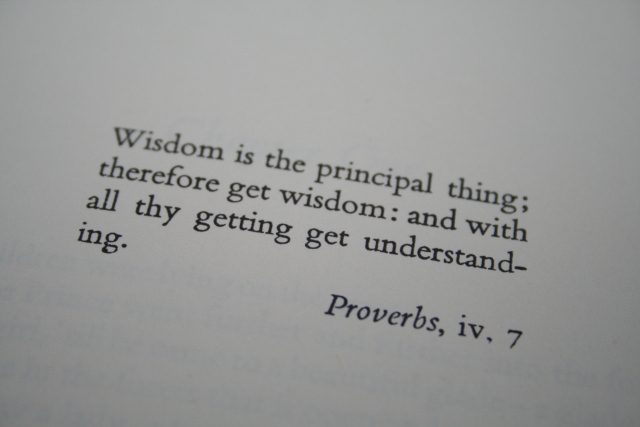 If you avoid conflict, chances are you’ll end up creating more of it. And if you avoid the truth, you are gutless. It’s easy to say who you are but much harder to be it. But you should never waiver from who you are. So make the tough calls. Take risks. Stick to your word. Swallow the lump in your throat. Be bloody bold. Make yourself proud. 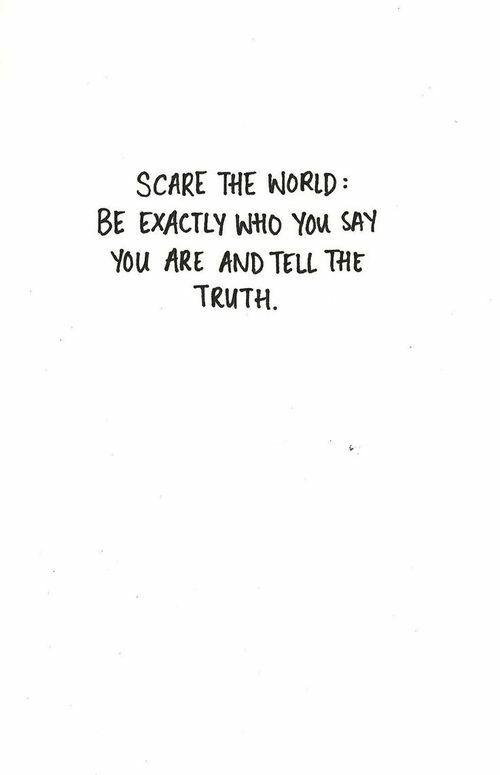 And every other mofo who dares to stop you from being honest and being you. It’s worth remembering that people, not all, but some, will take advantage of you when and if they can. Being taken advantage of isn’t always the end of the world. But it’s very, very annoying. It’s worth remembering that people will often forget the things you have done for them; the very good things. The things you have sacrificed. The time you have spent helping them. People forgetting the things you have done isn’t always the end of the world. And it sometimes results in being taken advantage of. It’s worth remembering not to have too much to do with dumb people. They are forgetful. They aren’t ‘with it’. They’re rarely up-to-speed. When you have things to do with dumb people you spend a lot of time repeating yourself. Going over old ground. Going around in circles. It isn’t always the end of the world. It’s worth remembering that some people are selfish. Some people are obviously selfish and some are less so but selfish is selfish. So because of that it’s worth remembering to look after yourself; your priorities and interests, first and foremost, before you sacrifice too much and put the dreams and ideas of others before your own. Because in the end those people will look after themselves; they will take advantage and forget the things you have done because they are dumb and selfish. And being too loyal, too kind, doesn’t win you any prizes. Sometimes there’s no prize to be won. Maybe there’s some acknowledgement or recognition. Maybe there’s a little thank you or some appreciation. It’s worth remembering that you won’t always get that, even if you never expected it. And so, it’s worth remembering that you can learn your lesson once, twice, even three times and then still find yourself back to where you once were, wondering how you forgot about people that take advantage and forget the things you have done, people that are selfish and dumb. So try not to forget. Do your very best to remember. Put your energy and effort into the things you love, the things that build your dreams in the night and pump blood to your heart in the day. Spend your time with the people you know are not selfish and dumb. And then you will not be forgotten. Or taken advantage of. But be grateful you once forgot, because it reminded you to stop and walk in a straight line, along some new ground.